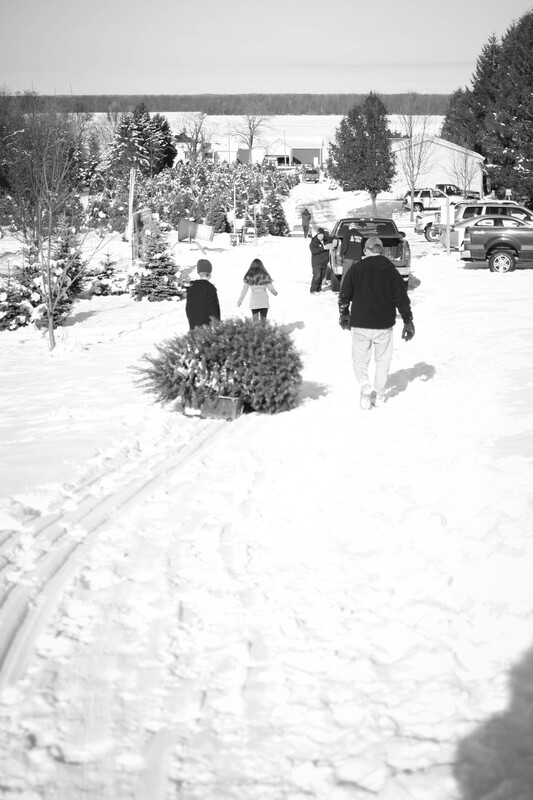 Cutting down the Christmas Tree. It’s a tradition and one of my favorite days of the year! This was taken with my Canon DSLR paired with my 35 mm 2.0 lens. It was taken with the super bright noon time sun reflecting off the fresh white snow, so my settings were at ISO 100, shutter speed 4000 and my aperture at 2.0. It was a quick edit in iphoto, where I simply changed the photo to black and white. This past Tuesday was one of my favourite events in the run up to Christmas, and guaranteed every year to help get me into the Christmas spirit (I am a very reluctant wrapper). We had 3 years of concerts with Ella and her clarinet at Riverwood Middle School, Jack joined her during her last year to play the cornet. 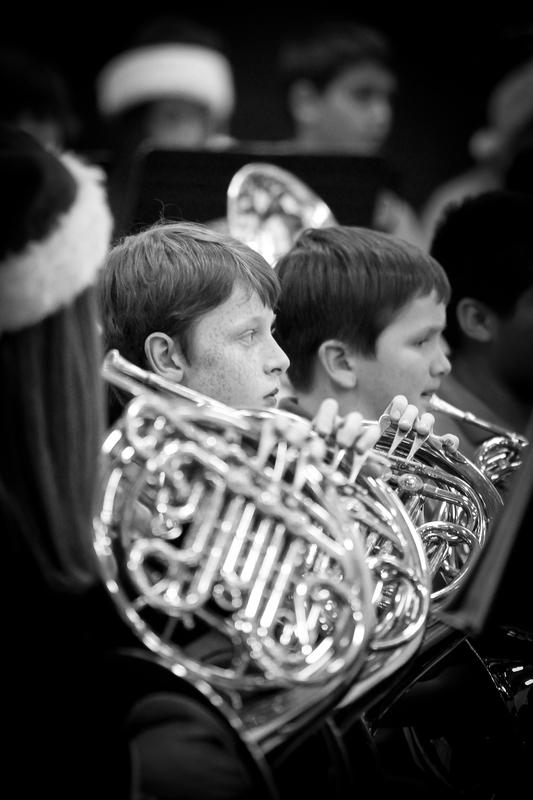 With Jack now in 8th grade and due to go up to high school in 2014, it was Will’s turn to play the french horn in his first Christmas band concert, Jack in his last. He really is a complete goof ball, and this is one of the only pictures I managed to take, when he wasn’t actually playing his instrument, where he was quiet and not actually talking. Yes this was the kids who mouthed “Why thank you” when everyone applauded at the end of the last song… his 6th grade french horn playing friends looked very entertained. Taken at around 7:15 in the evening, across a large, packed gymnasium, with horrible fluorescent lighting, I used my Canon DSLR paired with my 70-200mm f/2.8 L lens. I set my ISO at 1000 due to the poor lighting conditions, with my aperture set at it’s widest, f/2.8, to let in as much available light as possible. Finally my shutter speed was 1/125. I focused and recomposed the image on Will’s face, and as you can see the he and his instrument are in focus. Post processing in Lightroom 4, I cropped the image and converted it to black and white. I wanted to have contrast between the white, greys, and blacks in the image, and so initially I decreased the temperature significantly, then increased the contrast, whites, and clarity, then decreased the highlights, shadows, and blacks in the image. I then sharpened the image, and decreased the highlight priority in post-crop vignetting, so that I could really try and highlight Will in the image.